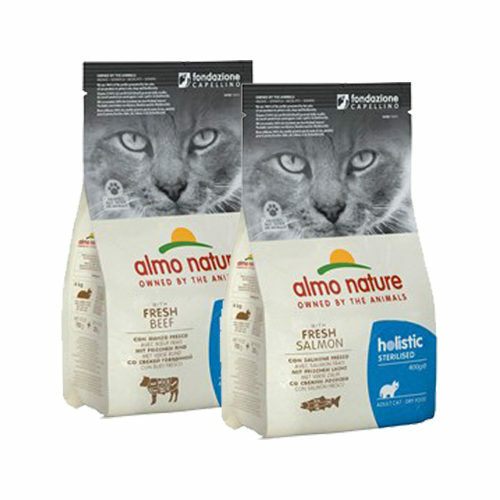 Almo Nature - Cat - Sterilised is delicious cat food specifically composed for neutered cats. This cat food is available as dry and wet food. This cat food has a low magnesium level, making it suitable for a neutered cat's diet. Almo Nature - Cat - Sterilised is tasty cat food for your cat, available in both a wet and dry variety. This food has been specifically composed for neutered cats. The food has been specifically tailored to meet the daily nutritional needs of neutered cats, so it will perfectly suit their diet. This food has a low magnesium content. This food contains delicious fresh meat or fish, so your cat will most certainly love this meal! Beef & Rice Dry Food: meat and animal derivatives (15% fresh beef), grains (14% rice), vegetable protein, oils and fat, derivatives of vegetable origin (0.5% fibre, 0.1% inulin from chicory, a source of FOS), yeast, minerals, mannan oligosaccharides, seeds (0.1% linseed). Salmon & Rice Dry Food: fish and fish derivatives (16.8% fresh salmon), meat and animal derivatives, grains (14% rice), vegetable protein, oils and fat, derivatives of vegetable origin (0.5% fibre, 0.1% inulin from chicory, a source of FOS, 0.3% yucca chidigera 0,3%), yeast, minerals, mannan oligosaccharides, seeds (0.1% linseed). Chicken wet food: Meat and animal derivatives (4% chicken), fish and fish derivatives, derivatives of vegetable origin, vegetable protein extracts, minerals. Cod wet food: Meat and animal derivatives, fish and fish derivatives (4% cod), derivatives of vegetable origin, vegetable protein extracts, minerals. Have you used Almo Nature - Cat - Sterilised before? Let us know what you think about this product.